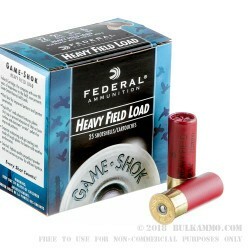 The #6 shot in this Federal Heavy Field Load offers versatility to this excellent loading of a standard field grade shotshell. This is suitable for field birds and upland birds where lead is still king. The heavy 1 ¼ ounce wad cup is enough to get your pattern out to all reasonable distances and the patterning is exceptional at the dictated ranges. 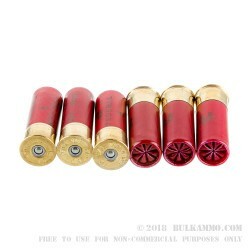 This shotshell is a premium version of a value priced field load. It features a high base to increase performance on a couple different aspects of the build. It will load and function flawlessly in all pump guns and most semi autos. This is a company that knows what they are doing and represents one of the largest commercial producers of ammunition on the planet. 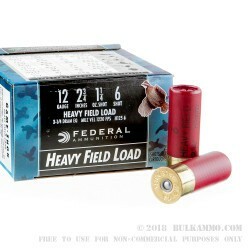 Federal is a fantastic ammunition producer and the legacy of the machinery and the legendary reliability of the Federal shotshells is very high level. 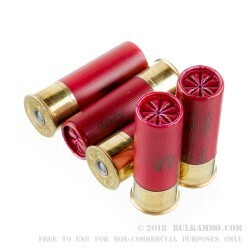 These 2 ¾” shotshells will work in any 12 gauge shotgun and offer quite the performance for a moderate price point and will be effective to intermediate ranges on the animals listed above. This is for a box of 25 rounds.